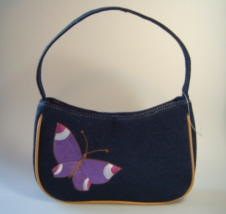 A pretty bag, perhaps for younger girls who like to feel grown up! Size of bag not including handle is approximately 25cm x 14cm. Inside, the handbag has a black lining and one internal zipped pocket. Butterfly Trinket Box (with necklace) A very pretty heart shaped turquoise trinket box with a large butterfly on the top. A pack of two butterfly hair elastic scrunchies with an organza covering in either pink or purple intertwined with a metallic light reflecting chain. A colourful china butterfly mug with a variety of large and small pretty butterflies in a multitude of colours on a cream coloured mug.